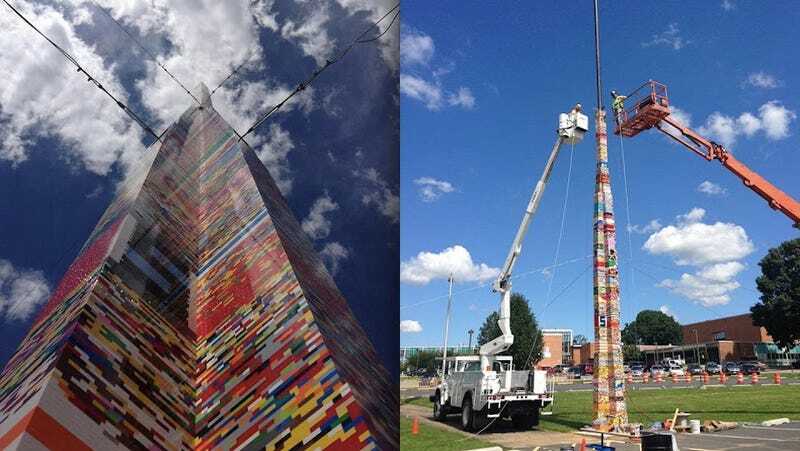 Tonight, after months of blood, sweat and tears a team of students from Wilmington, Delaware, broke the Guinness World Record and built the world's tallest Lego tower. For the students, this victory was personal. They struck a powerful blow to their Lego arch-rivals, previous record-holder, the city of Prague. The American Lego tower stands over 112 feet tall, and is made of more than 500,000 bricks! Tonight, the final piece was fitted in front of Guinness World Record Book representatives. This effort towers above the previous record-holder, the Czech Republic, whose 106-foot Prague tower, now seems positively Lilliputian. These Delaware students gave up their summer vacation to follow a dream. A dream of eternal Lego fame. Now they'll be welcomed into the halls of Valhalla, as Lego warrior-gods.